Hello and welcome back once again to Winnie and Walter’s October new release. Today is Day #4 of premiere. Hope you are getting inspired by the gorgeous cards using the new stamp sets, cutaways and creative screenings so far. If this is your first time here, then here are Day #1, Day #2 and Day #3 premiere posts. 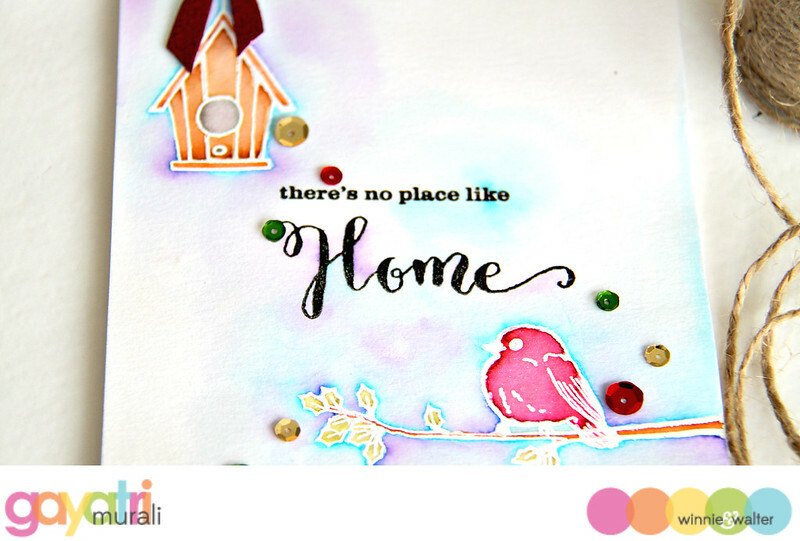 Today we are premiering three stamp sets called Happiest of Holidays with Evelin T Design, Merry and Bright with Evelin T Design and Mini Scenery: Do You See What I See?, one die set called Essentials: Noelle Cutaways and one stencil called Scenery: Do you See What I See? creative screenings. I love them all but first two stamp sets are pretty. They are predominantly holiday sentiment stamp sets with little images to go with it. The hand written fonts of the sentiments are lovely and sentiments are nice and big as well. My first card for today is using Happiest of Holidays with Evelin T Designs stamp set. I love the birds and cages in the set. I decided to watercolour them. I stamped the images in versamark and white heat embossed them on watercolour paper. I then used Zig Clean Brush pens to watercolour the images and the background. Once the paper is dry, I stamped and heat embossed the sentiment also from the same stamp set. I then trimmed off half and inch from the bottom of the panel, added a strip of red strip of glitter paper to the bottom. On the bottom of the card front, I stamped the Mini Scenery – Multigrain image with brown ink, then mounted the watercolour panel to the top of the card front using foam adhesives. I then embellished with Pretty Pink Posh Classic Christmas Sequins mix. I also added a red glitter bow from Essentials: Noelle Cutaway to the top of the birdcage. Here is a closeup of the card. Second card show cases Merry & Bright with Evelin T Design stamp set. I love the big, bold handwritten sentiments in this set. Just gorgeous! I started with sponging distress inks in ombre colours from pink to red on Peppermint Creative Screening. I then die cut a scalloped panel using the die from Esssentials: Noelle Cutaway and repeated the sponging technique. Once the inks are dry, I black heat embossed the the big bold sentiment on the panel. The panel is lined up to the card base and adhered using foam adhesive to give dimension. I brushed all the red sponging area with Wink of Stella clear shimmer. Oh my! the card looks so shimmery under the light. Just beautiful! Who does not like shimmer? huh? I embellished the card with Sparkly Clear sequins from Pretty Pink Posh. Tomorrow is the release! Happy Shopping everyone! These are fabulous! I adore the bird card!!! 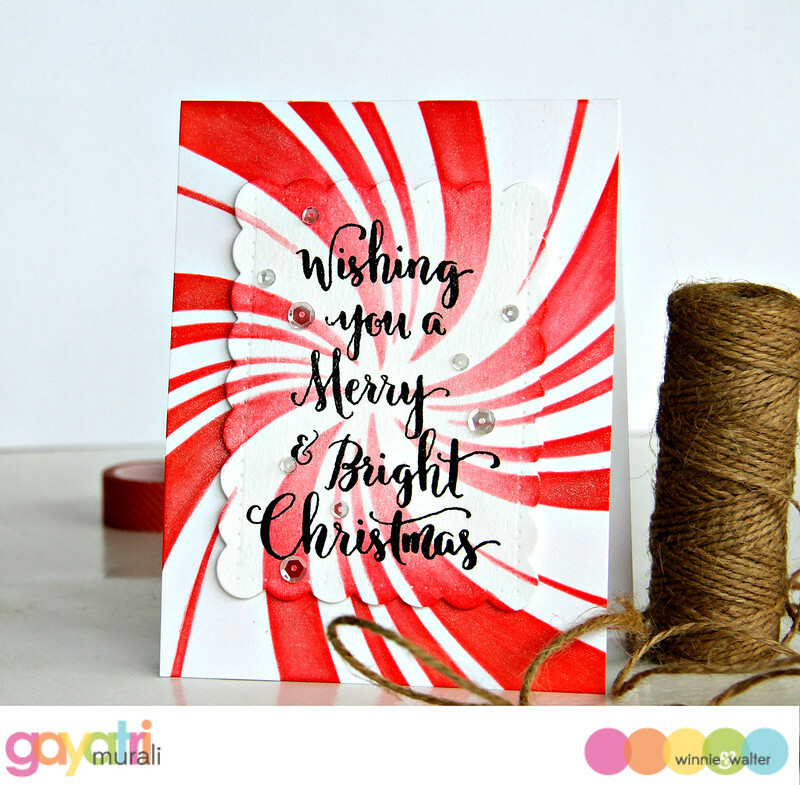 WOW – WONDERFUL cards Gayatri!!! 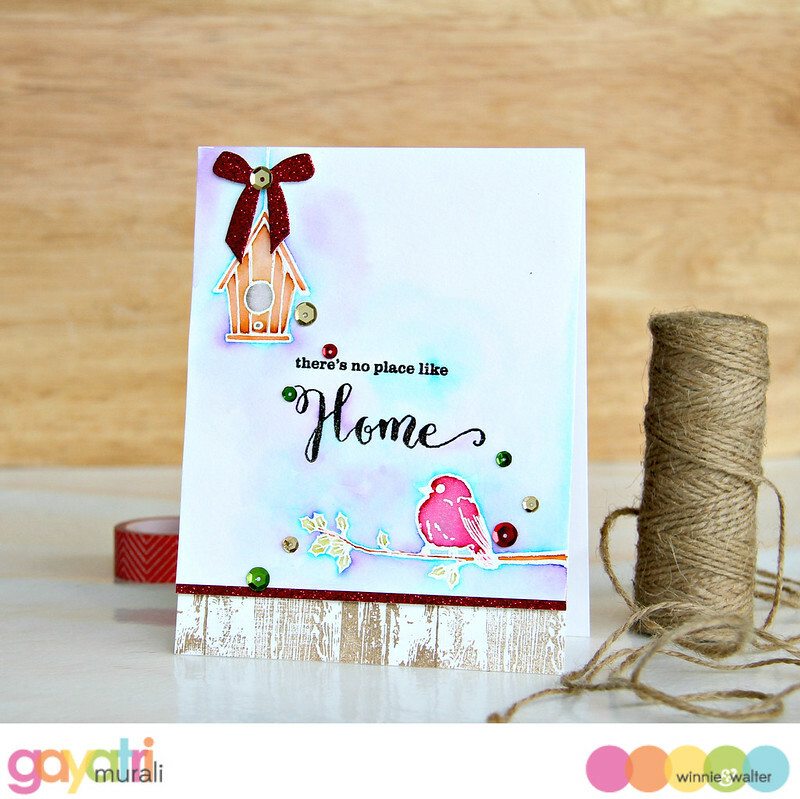 Your bird with the CUTE little birdhouse and inky background is BEAUTIFUL!!! These are gorgeous!! Love the new stamps! !